Healing Smoothie Packs (AIP/Paleo) and the new AIP Freezer Cooking e-book! One of the most crucial aspects to a real food healing diet is preparation. I’m not going to lie, healing protocols are not easy, they are hard work and it takes dedication. You spend a lot of time in the kitchen preparing meals because chances are you’re not going to find any packaged frozen meals or ready-made convenient foods at your local grocery store. Although convenient meals are not likely readily available, there is a way to make things easier on yourself! Enter freezer cooking. Freezer meals have truly helped me to stay compliant when time is limited, while travelling, or on those stressful days like when the kids are sick or when I just have too much school work that needs to be done. And then there are those days when you just can’t handle cooking another meal, which ultimately results in a buttload of dirty dishes! Having meals already prepared and in the freezer is a FANTASTIC way to give yourself a well-deserved break. Freezer Cooking for the Paleo AIP. 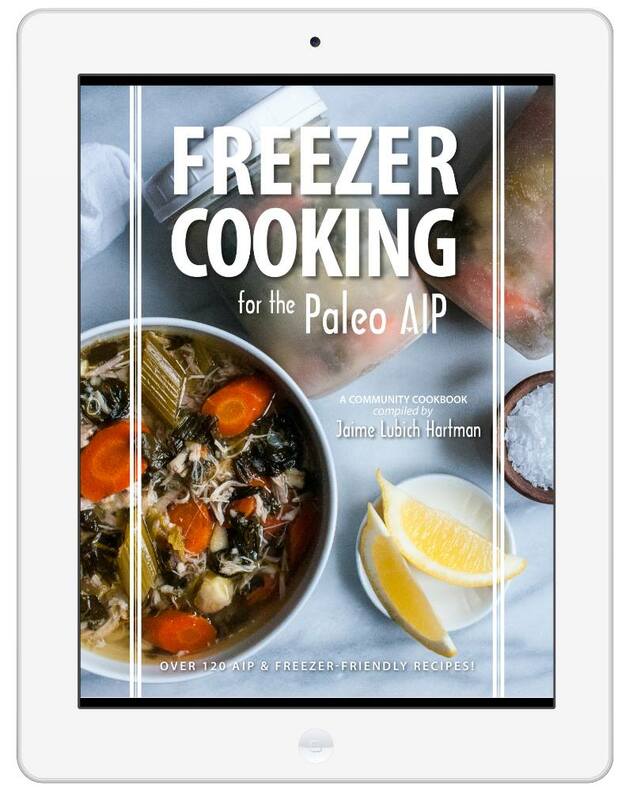 Includes over 120 freezer-friendly AIP compliant recipes (73 exclusive recipes) from 30 contributors, including yours truly! All recipes include directions for packaging, freezing, storing, and serving. You’ll find recipes for each meal of the day as well as recipes for special occasions. 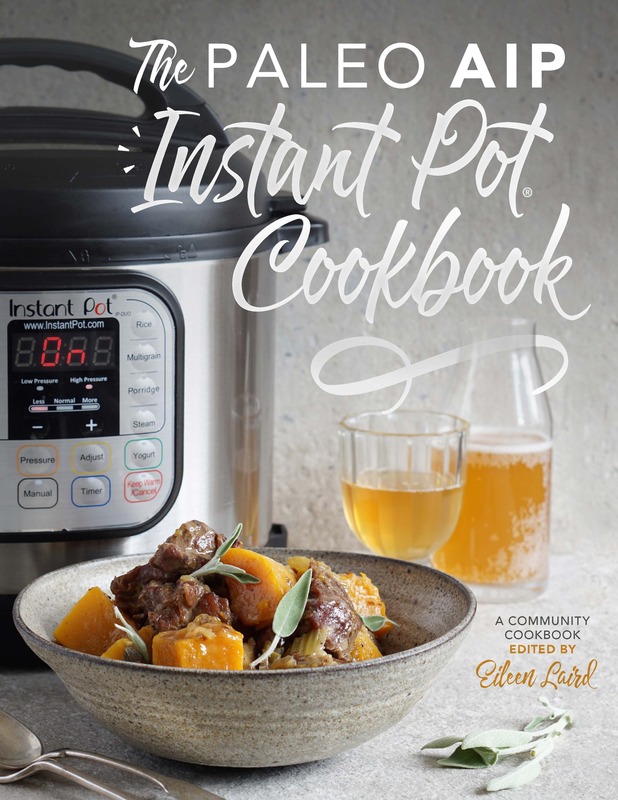 Some recipes are even from popular print AIP cookbooks, such as He Won’t Know It’s Paleo, The Healing Kitchen, and The Paleo Approach Cookbook, which are all adapted to be freezer-friendly. Exclusive recipes from the executive chef of Paleo On the Go! Today I’m sharing with you one of my recipes from the book, Healing Smoothie Packs. Not only are these smoothie packs nutrient dense, but they also save so much time (and dishes) on those busy mornings! Simply empty bag into blender, add collagen and water, purée, and serve! Remove stems from kale and chop. Remove avocado peel and pit. Place kale, avocado, banana, ginger, beets, and strawberries into a freezer-safe bag. Remove as much air as possible from bag before sealing. Remove smoothie pack from freezer and empty ingredients into a blender. Add collagen and water (start with 1 cup) and blend. Purée until smooth, add more water if needed to get it moving or to get a smooth consistency. TO ENTER go to the purchase page and answer the questions in the Rafflecopter box. No purchase is necessary. Runs through October 9, with entries closing at 11:59PM Eastern time. *Unfortunately, due to shipping restrictions, only entrants with US addresses are eligible to win the prizes from Paleo On the Go, Hot Logic, and ShopAIP. The others are open to everyone, except where the giveaway would be prohibited by local law.